Simple, ergonomic plastic buckles are our most common collars. Easily removed with one hand but strong enough for any dog. Available from 1/2" up to 2" wide. Sizes we stock include 1/2", 3/4", 1", 1.5", and 2". Various colored buckles available in widths up to 1.5". 2" only available in black. Metal buckles are available upon request as an upgrade. They are available only in 1", 1.5" and 2" widths. Metal buckle upgrades may require special order if materials not currently in stock. Sales, special offers, and discounts do not apply to metal hardware upgrades. A martingale has all metal hardware and slips over the dog's head. It has a separate loop that where the leash fastens that tightens if the dog pulls. 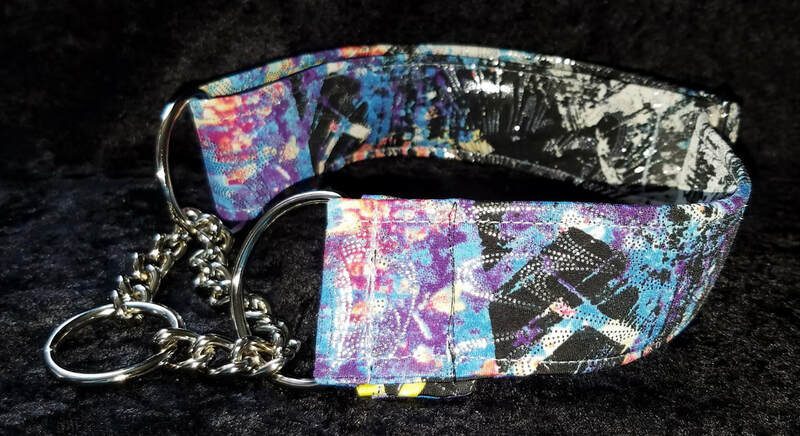 This prevents a dog from slipping or pulling out of the collar. Great for training and puppies and gives the handler better control. Available in all widths. 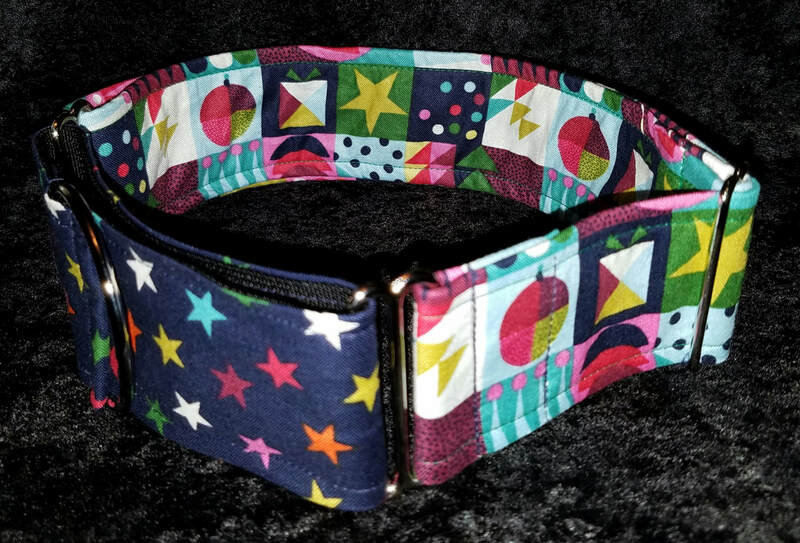 Also available with smaller martingale loops (e.g. 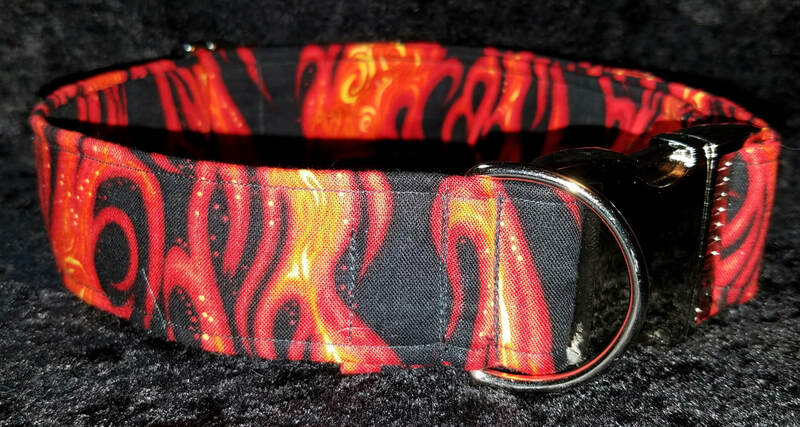 1" loop, 1.5" collar). A chain martingale gives the same advantages of a martingale but extra strength. For puppies, you can use the collar as a training tool. 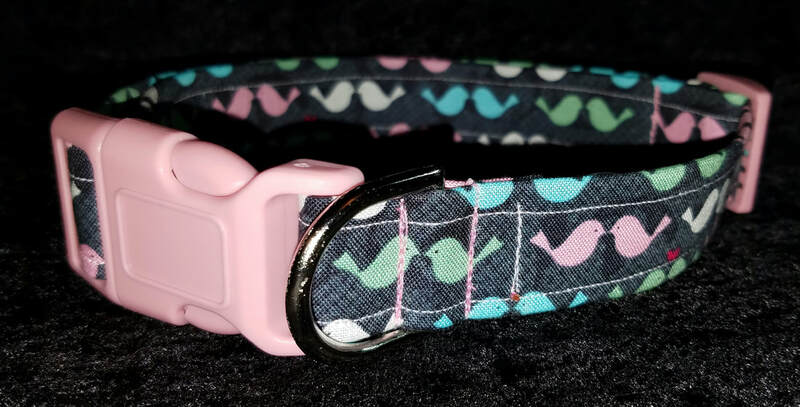 The chain works as an additional reinforcer by making a sound to alert them when they get too close to pulling.This is a versatile collar. Available in 1/2" increments. A buckle chain martingale offers all the same advantages as any other martingales but, in addition, you can buckle it on and off. Witih slip on/off collars, you may have to make adjustments to fit when removing the collar. With a buckle you can obtain the perfect fit. This is great for dogs who are sensitive about things going over their head or touchy about their ears - as in those who have cropped ears, etc. Available in 1/2" increments.